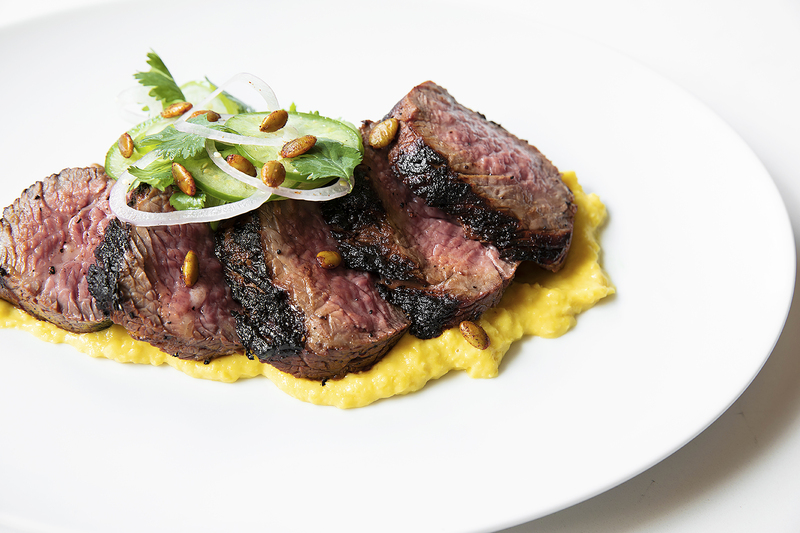 Wood-Grilled Santa Maria Steak with tomatillo escabeche, corn purée and spicy pepitas at Indianola. 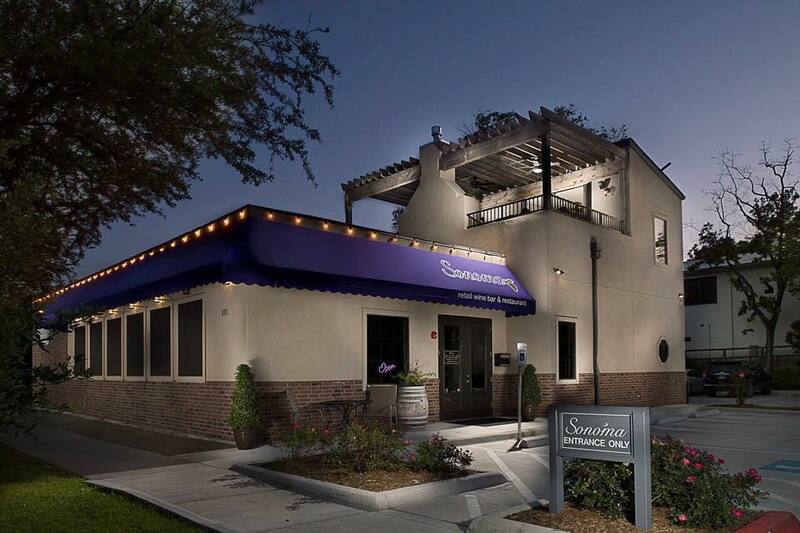 While all of the one-off Southern Smoke Spring dinner events are sold out, diners can still take advantage of two fundraiser steak nights being hosted at restaurants all across the Greater Houston area on Tuesday, April 16 and Wednesday, April 17. Local Texas beef purveyor 44 Farms is donating the meat, so 100 percent of the cost of the dish is going to the Southern Smoke’s Emergency Relief Fund. The fund provides assistance for restaurant and bar industry personnel in crisis. The participating Southern Smoke steak night restaurants, as well as the dishes served by each, are organized by neighborhood below. 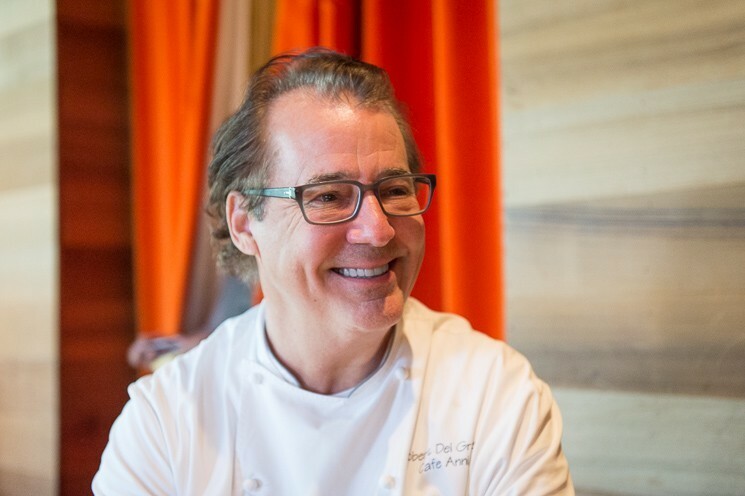 Good news for diners: the steak features range from as low as $12 (for Miso-Marinated Beef Tongue at Kata Robata) to $52 (for Grilled Strip Loin with glazed shiitake, shrimp and cheddar cheese curd grits and grilled onion melange with blueberry ginger demi-glace at The Refuge in The Woodlands). Reservations, when possible, are strongly encouraged. Grilled Strip Loin with glazed shiitake, shrimp and cheddar cheese curd grits and grilled onion melange with blueberry ginger demi-glace at The Refuge Steakhouse & Bourbon Bar in Tomball. Photo courtesy of The Refuge Steakhouse & Bourbon Bar. The Original Ninfa’s on Navigation, 2704 Navigation: Mole-Rubbed Boneless Ribeye with red wine jus. $45. Beaver’s, 6025 Westheimer: Smoked Short Rib with loaded taters and chopped salad. $16. Cafe Annie, 1800 Post Oak: Cantina Filet with avocado salsa, garlic butter and baked potato fries with smoked cheddar sauce. $35. 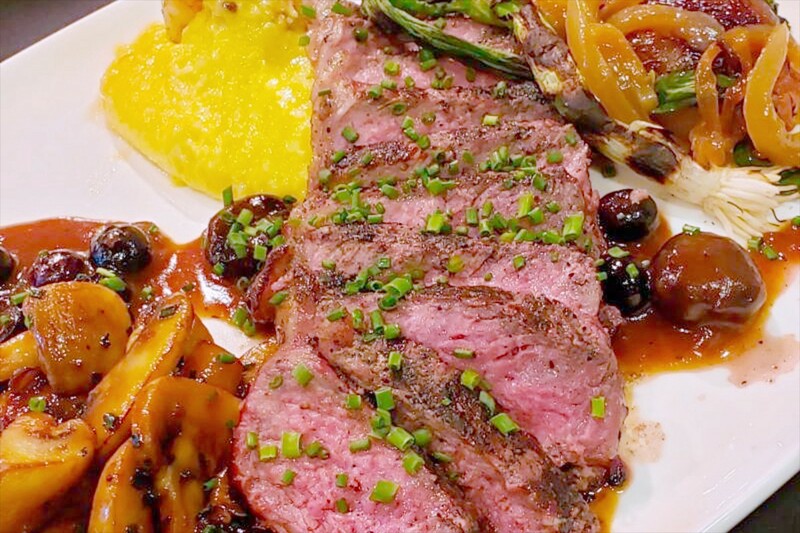 Coltivare, 3320 White Oak: 44 Farms Flank Steak Tagliata with vine tomatoes, heirloom polenta and red wine sauce. $35. Note: Coltivare does not take reservations. Brennan’s of Houston, 3300 Smith: Sugarcane Smoked Short Rib with bacon-tomato jam, fava bean puree and spring onions. Mopped with NOLA Tiger BBQ Glaze. $32. Goodnight Charlie’s, 2531 Kuester: 44 Farms New York Strip with elote creamed corn and a fried loaded potato with tajin butter. $20. The Hay Merchant, 1100 Westheimer: Sirloin Steak with mashed potatoes, seasonal vegetables and Diane sauce. $15. Hugo’s, 1600 Westheimer: Wood-Grilled Ribeye with papas bravas, asparagus and enmolada (corn tortillas in mole). $38. One Fifth Mediterranean, 1658 Westheimer: Kebab Soltani. $28. 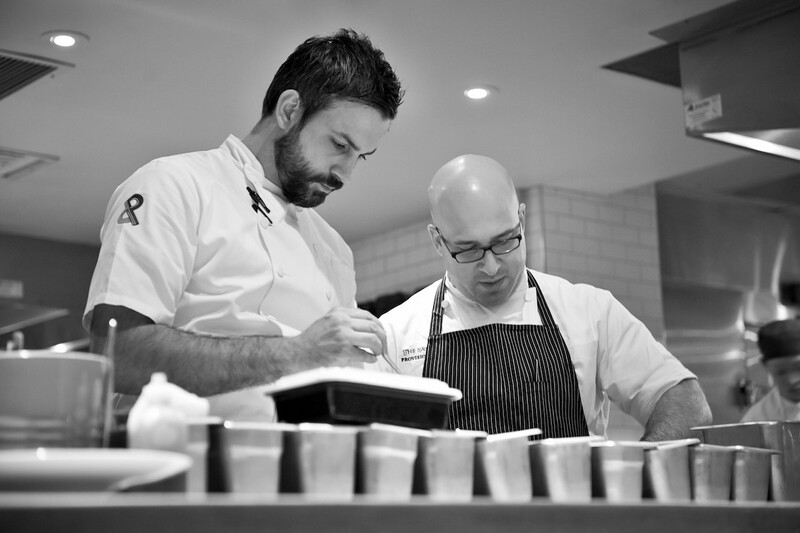 Executive chefs Seth Siegel-Gardner and Terrence Gallivan. Photo by Ralph Smith Photography. The Pass and Provisions, 807 Taft: Eight-ounce New York Strip roasted in the wood oven with broccoli puree and kimchi, cured yolks and a sesame-chili jus. $38. UB Preserv, 1609 Westheimer: Combo No. 88 — hot and sour soup, eggroll, fried rice and broccoli beef. $40. Uchi, 904 Westheimer: 44 Farms Striploin Tataki with persimmon and candied fennel. $36. Kata Robata, 3600 Kirby: Miso-Marinated 44 Farms Beef Tongue. $12. Chicken-fried sirloin flap steak at The Kitchen in The Woodlands. Photo courtesy of The Kitchen. 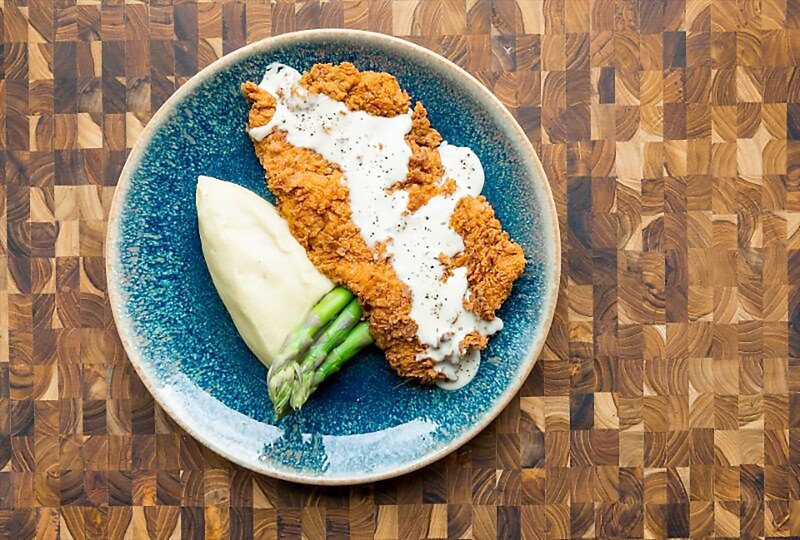 The Kitchen, 4526 Research Forest: 44 Farms Sirloin Flap Chicken Fried Steak. $19. The Refuge Steakhouse & Bourbon Bar, 8540 Creekside Forest: Grilled Strip Loin with glazed shiitake, shrimp and cheddar cheese curd grits and grilled onion melange with blueberry ginger demi-glace. $52. TRIS, 24 Waterway Avenue: 44 Farms Short Rib with kimchi potatoes, blistered shishito peppers and apple cider vinegar hollandaise. $42.